Air Deflectors are installed in the vehicles to keep elements such as rain, sleet, bug and snow away from vehicle window and sunroof. The air deflector also reduces the noise from wind even if your windows are down. Apart from preventing rushing air from entering into vehicle, the air deflectors can also be used for giving better look to the vehicles. Global air deflector market is expected to witness significant growth over the forecast period. The market is expected to thrive on the back of growing automotive industry across the globe. Increasing sales of vehicles and increased spending of consumers on vehicles ornament are likely to be the key drivers behind the growth of market during the forecast period. Regionally, the global air deflector market is segmented into North America, Latin America, Europe, Asia Pacific and Middle East & Africa regions. Among these regions, Asia Pacific air deflector market is expected to witness significant growth in global air deflector market by the end of forecast period. The market of air deflector system is thriving on the back of growing automotive industry across the globe. Increasing number of vehicles on road is likely to augment the growth of global air deflector system market over the forecast period. Additionally, India, China and Japan are some of the major vehicle producer countries and are expected to contribute significantly in the growth of Asia Pacific air deflectors market during the in Asia Pacific region. Further, window air deflector segment by type grabbed major shares of market in previous year and is expected to continue this positive growth over the forecast period. Availability of wide range of designs of air deflectors and materials such as ABS plastics and acrylic that can enhance the interior ambiance through preventing outdoor elements and can offer better look to the vehicle are expected to drive the growth of this segment during the forecast period. The increasing sales of vehicles are the major factor which is responsible for the growth of air deflector market. In addition to this, the global automotive industry is driven by a number of factors such as rinsing consumer’s affordability, growing income of consumers and availability of easy financing options to buy a vehicle. Further, this growth in automotive industry is fuelling the growth of air deflector market. According to OICA, 94.7 million motor vehicle productions were held to be in 2016. Moreover, this represented a Y-o-Y growth of 5.0% as compared to 2015. Additionally, automotive production is anticipated to increase on the account of rising demand. This factor signals promising growth of the Air Deflector market in upcoming years. 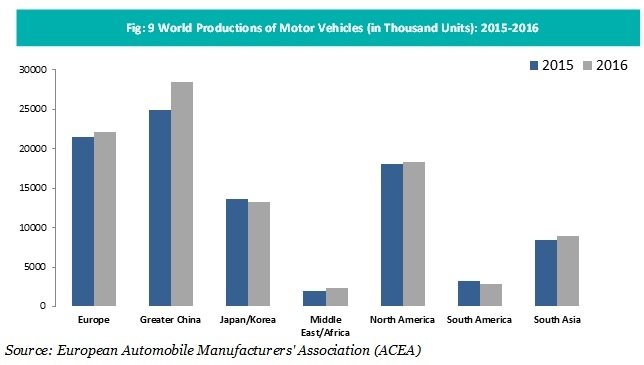 Further, global automotive industry is booming on the account of urbanization and rising disposable income. This massive growth of automotive industry is growing the air deflector market all over the globe. For instance, total global production of cars in 2016 reached 72,105,435 as compared to 68,539,516 in 2015. Automakers such as Jaguar Land Rovers and BMW are executing aggressive expansion plan to boost the production and sales of the company across the globe. This factor is projected to bolster the growth of Air Deflector market in future. Growing aftermarket sales of air deflector is also strengthening the growth of market across all regions. However, fluctuations in prices of plastic composites and other materials used in manufacturing of air deflectors may hamper the growth of air deflector market in upcoming years. Peterburg Industrial & Design Co.,Ltd.